A deeper sense of peace. Greater connection with self and others. Easier decision-making with greater clarity. It’s the same ingredient you’ll find in abundance in art galleries. It’s what draws attention to the art, allows us to really focus on it and feel its effect on us. I love to look across a nearly blank room, see a work of art and notice how my breathing changes. I love to discover the way it makes me feel. If galleries crammed works of art together like wallpaper it could be more efficient, save time and money. Several shows could open at once. But it wouldn’t be nearly as effective. Without white space, poems are just a jumble of words and music is just a wall of sounds. A conversation without white space is people talking at each other, but it’s not a dialogue. When I left my first marriage I moved out of our home that I’d spent months renovating and into a small apartment with a mountain view. At first, I had only a foam mattress, linens, clothes, a pot, a bowl and a pair of chopsticks. There was nothing to sit on but the carpet, nothing to look at but the mountains and white walls. What I discovered was peace. When my eyes looked around they could easily settle outdoors. When I ate I could feel the texture and weight of the clay bowl and wood chopsticks and taste each bite of food. That was my first experience of living with white space. I was very careful about everything I brought into my home, making sure it gave me joy and didn’t upset the balance of space. This was a beautiful contrast to my crazy busy world where I was booking meetings months in advance with little space in my day. Now I consciously surround my days with white space. It elevates my life to a work of art. Stress has become such a norm in many of our lives that we’re used to feeling tight and constricted. Even as we rush to fit in a yoga class we feel our tensions rise. But I know that I’m not unique in my longing for white space. When I work with my clients they often use the word spacious to describe how they feel about the changes in their life. They experience more peace, tap into their creativity, feel better about themselves, enjoy relationships more and access their own unique greatness. Sometimes the idea of white space is scary. You’ll be alone with yourself, your thoughts, fears and desires without distraction. Many people stay busy to avoid that. But you’ll find if you ease into adding white space a bit at a time and be gentle with yourself, you’re quite a wonderful person and more deserve to take up more space. Give yourself a 2 – 5 minute break before shifting from one project to another. Turn off all technology during meals. Go for a walk outside during your workday. Close your mouth and listen more in conversations. Close your eyes and taste your food. Set an alarm and meditate for just two minutes. Turn off all distractions and let yourself focus on a task for an hour. Create a simple ritual for morning or night that gives you a sense of space. Clear clutter in a part of your home until that space is a source of peace. I’d love to hear how you’ve added white space to your life. 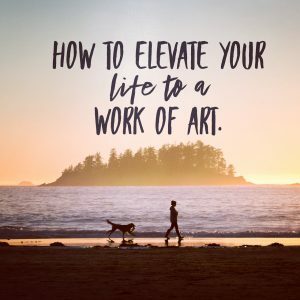 Add more white space and elevate your life to a work of art. Never give a gift with strings attached. It’s not about being present. I really enjoy those i deas and I am anxous to try them. My computer is a it tempermental or typing letters so I am brief right now. How poignant…thank you for the simple and beautiful reminder! You da best! Yes, lovely Deb….and of course we can try to notice space directly….relax your eye muscles…soften your gaze…so it feels like your eyes are receptive/receiving, not reaching out to evaluate or scan….notice the room/place you are in as a volume….and notice how much empty space there always is….notice the space between you and what you are looking at, adjusting your focus as if you saw a speck of dust floating in the sun’s ray in front of you.